Better Health Information from Doctors. Black stains on the teeth are removable. Determine the cause of the staining, and seek proper remedies to get your pearly teeth and bright smile back. Dazzling white teeth are the hallmark of a beautiful smile. There’s an overwhelming amount of toothpaste advertisements that feature a mouthful of pearly white teeth that are the result of using XYZ brand of toothpaste. But white teeth aren’t all about beauty. They are also about healthy teeth. If you have stained teeth, it is important to determine the cause of the stains, and then to take steps to remove the stains. Healthy, white teeth contribute to a person’s appearance, making you look younger and more attractive. So it is certainly worth your time to take a little effort to ensure that your teeth are as clean as they can be. Get a professional cleaning done at least twice a year. Your dentist will not only clean your teeth, but also make certain that they are all in good condition. Stains on teeth can run the gamut from light yellow, through orange, green, bluish gray, to dark brown and black. 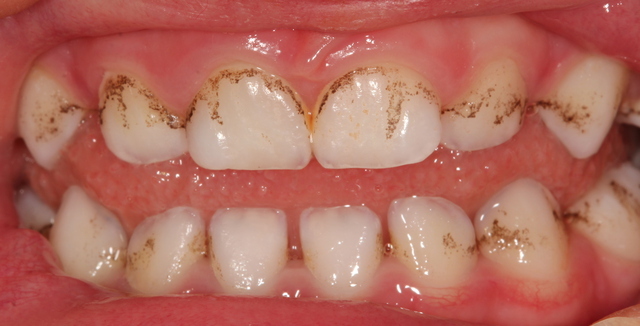 Different substances or health issues cause different colored stains on the teeth. The two major types of stains are intrinsic and extrinsic. Intrinsic stains originate inside the tooth, either in the dentin or the pulp. Extrinsic stains are on the outer surface of the teeth. Micro-abrasion. This method involves polishing the stained tooth’s surface with a mix of pumice and hydrochloric acid. This removes a very thin layer of the tooth’s enamel, so use this method with caution. Porcelain dental veneers. This method is one that simply covers the stained, crooked, or chipped teeth with porcelain veneers. The veneers will transform your problem teeth into perfectly white, straight teeth in just one visit to the dentist. You can get just a few of your problem teeth covered, or a complete set for a complete makeover. Although porcelain veneers are highly stain-resistant, you will still need to take care of them and avoid foods or drinks that are highly staining. There are a few simple cleaning agents that you may already have in your kitchen that you can combine to make a whitening paste to clean away the black stains on your teeth. 1. Make a whitening paste combining strawberries, salt, and baking soda. The Vitamin C in the strawberries helps break down plaque, and the enzyme malic acid in the berries may help to remove the surface stains. The salt is an abrasive. How to use: Mash one to three large berries, add just a pinch of sea salt, and ½ teaspoon of baking soda. Only leave this mixture on for about five minutes. Then rinse thoroughly. 2. Another option is to mix up a simple paste of baking soda and hydrogen peroxide. The baking soda combined with water breaks down the molecules that cause the stains on the tooth enamel. How to use: Use two parts of hydrogen peroxide to one part baking soda, mix it together to make a paste, apply it to your teeth and let it stand for about a minute, then rinse thoroughly. Only use this paste two or three times a week so it doesn’t break down the tooth enamel. 3. Whitening strips are available to purchase for use at home. The common kit will contain two strips, one for your upper teeth, one for the lower. The strips, made of polyethylene, have peroxide gel affixed to the strips. Read the box before you buy to ensure getting the right strips. Avoid strips that use chlorine dioxide. This chemical is used to sterilize swimming pools and can damage your tooth enamel significantly. 4. Whitening mouth rinse or toothpaste: Your teeth can be whitened and new stains can be prevented. Stick to the directions as some people get sensitive teeth when using these products. You can avoid some staining by drinking through a straw, which puts the drink behind your teeth. Clean your teeth religiously. Brush thoroughly, floss regularly, and use an antibacterial mouthwash. These procedures fight plaque buildup that stains adhere to. It is best, however, to wait for an hour or so after eating before you brush. This gives the tooth enamel time to re-harden so it isn’t damaged by brushing. See your dentist at least twice a year for a professional cleaning. Don’t use any form of tobacco, for a number of reasons. Not only does it stain your teeth, but also it kills. Beautiful white teeth are within reach if you follow the suggestions listed here! People who say I have a tooth hole without pain frequently have cavities in the early stage. Learn how it’s treated, as well as care to stay healthy. Toothache: Causes, Symptoms, Treatments and More! What Causes Tooth Pain While Having a Cold? CopyRight © WWW.MD-HEALTH.COM. Last Updated 26 April, 2019.